And what about that NASA and mushing connection? In addition to school, library, and programs for the general public, professional development workshops are available for educators. These workshops can really expand and enhance a classroom and/or school-wide winter program, especially for those doing Iditarod or Yukon Quest thematic units. "Many many thanks for the workshop this morning! We were all so impressed with the depth of your knowledge and your ability to suggest curriculum ideas. The workshop lived up to all of our expectations and more!" As a longtime educator and a NASA Space Ambassador, Gail has left her classroom and expanded her teaching by working with teachers and students in their classrooms as she shares her favorite topics. 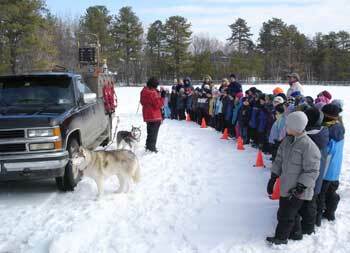 She provides sled dog education programs (with slides, videos, dogs, a sled and gear) as well as space education programs and professional development workshops to schools in Vermont and elsewhere. As an education consultant, Gail has even facilitated and presented educational programs about Mars with students and educators in the Yukon Territory of Canada. That lucky work project gave her the opportunity to have traveled twice throughout the Yukon, and explored some of the very large Northwest Territory venturing into the Arctic Circle once. On her first visit to the Yukon she also traveled into a small section of huge Alaska, Northwest Territory, and British Columbia. For more information and rates about sled dog education programs for schools, organizations, and the general public contact Atii Sled Dogs. A Inquiry/Reservation Form is here. Please read the update posts on the Dog Sled Ride Update page. If anything changes, it will be posted there, as well as on our Facebook page and via Twitter: Atii Sled Dogs @9dognight. I tweet and post education information and resources on Facebook almost daily. The obvious connection between sled dogs and space education is that Gail does both. The unobvious connection, that there really is a NASA project that involves sled dogs, can be found in a pdf, but stay tuned to this site (and the Vermont Space Education Program site) for more details. We care about the planet, our environment, climate change/ global warming and related issues. We always have and always will. Traveling by dog power is certainly one way to be kind to our planet, to remember and honor the past, and to think about our children's future. Educators: Email me if you are interested in taking a professional development workshop this summer--related to sled dog education. No photo, drawing, or text may be reproduced in any form without written consent. Written consent is necessary before linking this site to yours! This page last updated Dec. 12, 2007.